This Menu section contains advice and information to use the Identify: Images & Text Section, which is where the 295 species/morphotypes listed on this site can be identified. Species are arranged by subfamily and then by tribe following the taxonomic framework given in the Checklist Section (which is the same as in Plates 1- 10).. The named species are then further ordered alphabetically by genus. Each species has its own 'page', consisting of 1 large image and 1 thumbnail image, text content arranged under a series of Tabs, and a Title Line . In this title line the binomial name (genus + species) comes 1st, followed by the author of the description (the 'authority') and the publication date of the original description, e.g 'Epaena candidatalis Swinhoe, 1905. Where the genus to which a species has been assigned by the original describer has subsequently been changed to another genus, the name of the original describer is usually given in brackets. In this work, following Holloway's The Moths of Borneo, this arrangement has not been observed, as the text makes the position clear that the genus named has changed. At the top of the species' page there is a Title Line on the right side and a series of Tabs on the left. Tabs 1-5 currently have content. The others are for future use. Note that the old specimens have localities spelt in the colonial way e.g. 'Paloe' for 'Palu"
The exact location of many type specimens in the NHM is given by indicating the drawer number in the microlepidoptera collections. Following the relocation of the specimens into the newly built Darwin Centre 2 on the London, NHM, Cromwell Road Site and transfer of specimens into modern cabinets, the numbering system is in the process of changing to the form Mi xxxx where Mi represents the microlepidopteran collections and xxxx represent a unique four figure drawer number. The former system of indication of family code and drawer number is still in use for those groups not yet updated. Tab 2 is Description beginning with wing length (base of the forewing to the apex), or range in mm. The wing pattern and colours are described, with other features useful for separating out the species. Where there is significant sexual dimorphism, details are given in the Plates and text. Tab 3 is Distribution & Habitat. The geographic range, habitat types and altitude spread are given. It should be noted that the geographic range is most likely far from complete for most species due to lack of material. In the preamble to the Checklist the habitat categories used are listed. Tab 4: Life History & Pest Status. Only a few known major pests are recorded amongst the thyridids. There are more amongst the pyralids. Hardly anything is known of the life history and food plants of the great majority of species. A rare insight into larval defence mechanisms will be found in Darling D.C. (2003). 'Morphology and behaviour of the larva of Calindoea trifascialis (Lepidoptera: Thyrididae), a chemically-defended retreat-building caterpillar from Vietnam'. Zootaxa, 225: 1-16. There is clearly much interesting work to be done on life histories and behaviour of thrydids. 'A molecular phylogeny for the pyraloid moths (Lepidoptera: Pyraloidea) and its implications for higher-level classification'. Full details of this paper can be found in our 'References' Menu Section. There are more Tabs for future use. Although this is speculative for now, it may well be possible in the future to scan genitalia in 3D and then print out a solid (enlarged) replica on a 3D printer using CAD software. The technology is getting closer. 'Home > Identify: Images & Text > Thyrididae > Siculodinae > Rhodoneurini > Mellea'. 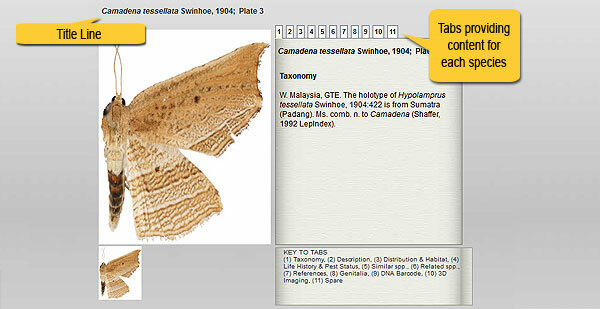 Navigating to the Section 'Identify Images & text' from anywhere on the site: Click on the red moth (Dysodia sp.) which occurs at the top of every screen.